Known in the Northern Territories of Australia as YIDAKI, and most likely the oldest musical instrument in the world. Cave paintings in Australia show didgeridoos being played in pictographs that date to 40,000BC. 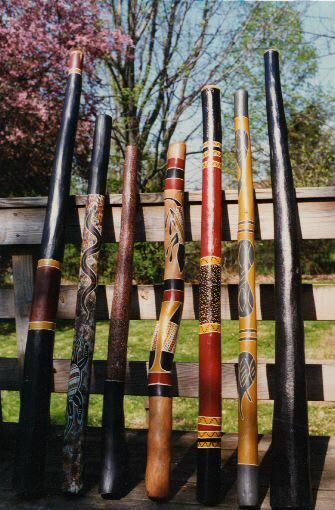 Made from the hollow log of the eucalyptus, bloodwood, or ironwood tree that has been hollowed out by white termites, and used as the primary ritual wind instrument of the Aborigines. Used in ceremonies to 'pull' the listener into the Dreamtime. Excellent entrainment tool.